Only 1 day until the next Ukraine Brides Free Speed Dating Event which will be on Thursday July 26th at 8pm Ukraine time (London 6pm, New York 1pm, Los Angeles 10am). We have set some guidelines to make it fair for both the men and the ladies. The ladies want to be able to see who is calling them, which is why you must have your profile completed. We have also set 5-minute timeframes to allow as many speed dates as possible during the event. • You cant exchange your contact details in the free chat – we must abide by IMBRA law. Also, a genuine lady is unlikely to give you her details without knowing you. We are delighted to offer this service and we welcome your feedback after the event. We received a great deal of positive feedback from members, both men and ladies following earlier events. Recently, our client Olaf from Beuningen, Netherlands has visited Ukraine. Our client feels here very comfortable and cozy over here. He has joint our site about a couple months ago. He has made an inquiry of a service of UBA first time. By the way, we were so happy to know that our client was very comfortable with our service, agency, and stuff. The client recommends our services to the men as he finds that to be really genuine. Ukraine is totally different from the country he came from. Here he liked local people but cannot judge all Ukrainian people by couple ladies he met up with. He trusts Ukrainebridesagency.com and is satisfied with it. Above all, Olaf recommends men to interact with the ladies via our video chat. It helps a man to understand the lady better, learn her and see her behaviour. Video chat provides a direct interaction with a partner. Most relevant, our client recommends our men to be serious about their search. It may be a very specific one, but you have o be careful and attentive. Do not play games if you are looking for a wife. You have to remain patient. Talking about an age gad it seems to be so individual and depends on both partners who are communicating and are about to have a serious relationship. However, a real meeting is rather to learn the lady. Olaf is looking for a lady with a nice sense of humour and a great body language. Most noteworthy, it is rather important to take your time and plan the trip very well and attentively. You have to pick up a nice hotel in a comfortable location. Please, watch the video of Olaf’s feedback and accept his all recommendations. Welcome to the amazing world of the lovely couples of Ukraine Brides Agency. We are extremely excited to share with you our latest news! One more star started shining the brightest ever. Please, greet our new happy couple Tam and Marina. They are definitely full of the joys of spring right now. Just take a look at the story they have shared. Thanks to the qualified team of Ukrainebridesagency.com and their local representatives in Zaporozhye – “Jasmine” agency I was able to meet the love of my life – Marina. Our first meeting took place in her native city before I came we had corresponded and had several video-chats. My impression of the website services is great, tried most of the services they offer and I was satisfied with everything. We started our correspondence in fall 2017 and I came to visit her in 3 weeks. Above all, when I came, Marina introduced me to her family. Her son and her parents, at this meeting the assistance of an interpreter was vital. I am grateful to the agency for their help. Furthermore, we had a very warm family dinner. Marina’s mother cooked Ukrainian food. For this reason, her father showed their family album and told a lot about Marina’s childhood and life. This meeting was very significant for me, as it showed that Marina is a serious lady, ready for the marriage. As a result, after this we met a couple more times, I supported her desire to study English and she does her best about this. Hence, we have recently married in Zaporozhye and now we are in process of making the documents that will allow Marina and her son to come and live in Canada with me. Hopefully, every user of this website will find their happiness with the help of the professional team of Ukraine Brides Agency (UBA)! We wish our sweethearts to be indeed happy and show others that love exists! They are our inspiration. For the recent updates and latest news follow our blog and take a look at our recent useful articles! At Ukraine Brides we are committed to protecting your information. Constitution Day is a national holiday to celebrate this historical event. A change in Ukrainian history was made when the Constitution of Independence was adopted on June 28, 1996. After gaining independence in 1991, following the collapse of the former Soviet Union, Ukraine began drafting a new constitution. This document established a legal foundation of independent Ukraine. Nevertheless, progressive in terms of human rights and freedoms for Ukrainians. Many TV and Radio stations broadcast Ukrainian anthem, which is a state symbol. “Sche ne vmerla Ukraine” (“Ukraine has not yet perished”) has been the country’s anthem since 1992. Some of the lyrics regard on a poem written by famous and talented poet Pavlo Chubynsky in 1862. 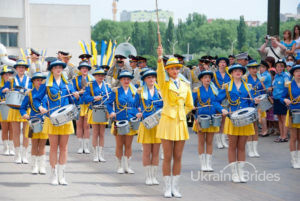 Many Ukrainians have an official day off and celebrate it with festivities: fireworks, musical events, singing Ukrainian anthem, large street parades. The Ukrainian president usually congratulates the country on Constitution Day. Constitution Day is a public holiday across Ukraine, so many business establishments, universities and public offices are not available. On this day you may enjoy walking in Kiev, Odessa, Lviv and other big cities and watching parades. Ukraine always wanted to be independent and that is why it celebrates this very day tremendously. If you ever decide to learn Ukrainian language, culture and see the way people celebrate fabulous holidays here please feel free to contact our travel agency Simply Travel http://simplytravel.international. Feel free to learn more about Ukraine. Kraig (Michigan) The free speed dating was really good. I haven’t used your web site in about a year before doing this. If you did not take part in the first event, remember that it is very easy to qualify. You just need to register (free) and complete your profile to 90% or greater, including your photo. It couldn’t be easier. The first Ukraine Brides speed dating event was a spectacular success. We are overwhelmed at the response and we are already planning the second event to be held in June. The aim of the speed dating event is to give members a free opportunity to chat with as many members as possible and fast-track their search for that someone special. We recently custom built our own video/audio chat system that works on any device, anywhere, at any time and we wanted everyone to be able to try this and see why this is such a unique feature in the Slavic dating industry, in fact, the entire dating industry. Kraig (Michigan) The speed dating was really good. I haven’t used your web site in about a year before doing this. We did receive some feedback to say that Thursday is not ideal, so the next event will be on a Saturday. This will enable everyone to participate. What is Trinity in Ukraine? The Feast of Triytsya, (Trinity Sunday), which commemorates the Descent of the Holy Spirit upon the Apostles (Pentecost) falls on the seventh Sunday after Easter. In English, it is also called Whitsunday and in Ukrainian, it is known as Pyatydesyatnytsya. 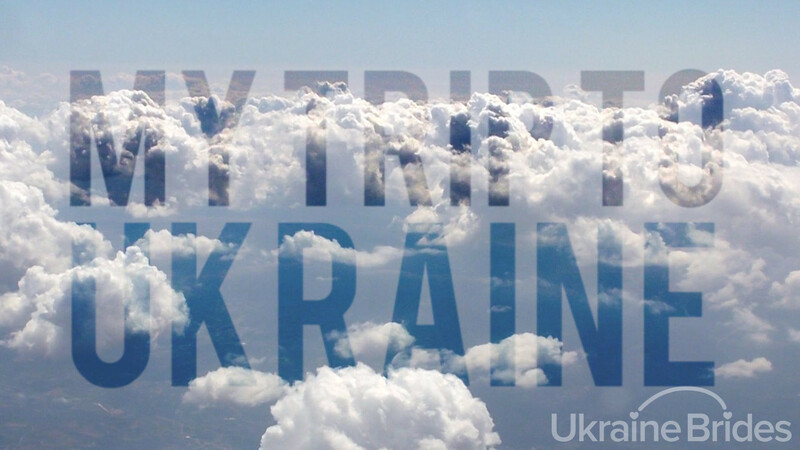 Holy Trinity Day is a very important religious holiday in Ukraine. Trinity is a moveable feast celebrating the Holy Trinity, the Christian belief that the nature of God exists as Three Persons – Father, Son, and Holy Spirit, but yet One God. Trinity is a kind of symbol of the return to life. On the time of this wonderful holiday, all nature comes to life, blooms and fills up with bright colors and alluring scents. On this day, all Orthodox people decorate their houses with greenery, birch twigs with calamus branches, prepare a festive table and invite relatives to come over for a celebration. 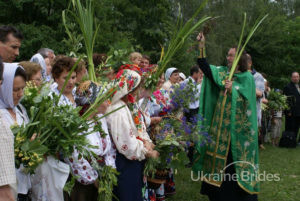 The celebration of Trinity in Ukraine is a big event with many people going to church and following traditional rituals. Join them in this celebration or just enjoy the “green” side of this wonderful feast! The day before Triytsya, that is Saturday, called Didova subota, the day of the commemoration of the dead. According to a popular belief, deceased people come to our world on the Green Thursday and stay here until the Troyitsky Thursday. That’s why it was prohibited to work during these days, especially to weave, sew or to cut wood. In order not to make any harm to the dead souls. That’s why people try to do all work in the garden and in the house before the Green Holidays. There is an awesome tradition with the wreaths. On Green Thursday the ladies went to the forest or to the field to make wreaths. After that, they returned to the village to tie the wreaths to the birch tree. On the Trinity Day, the ladies were checking their wreaths and taking them off the tree. If the wreath remained fresh, it meant the lady’s family would be happy. And if the wreath faded, it was not a good sign and meant the family would be unhappy. In Ukrainian folk rituals, wreaths, in general, is a symbol of great respect, youth, purity, and beauty. Also, the wreath made of fresh flowers is considered to be a defense against evil forces. People are going to attend church on Sunday. Monday is usually an official day off in Ukraine, so people may stay with their family, relatives, and friends and have a great time. God bless all people and make them happy indeed! Ukraine Brides Agency is pleased to offer our first free speed dating event which is unique to the online dating industry. We have developed our own in-built chat system, both text chat and video and audio chat and we wanted to make this available to showcase a feature that very few dating sites have available and also to provide an opportunity for you to try our site and services and start your search for that special lady. We have promoted the event to the ladies and there will be many ladies online wanting to meet their special man. We encourage you to try it for yourself. We are delighted to offer this service and we welcome your feedback after the event. We will be offering regular free speed dating events and we will advise you of the next upcoming event closer to the time.